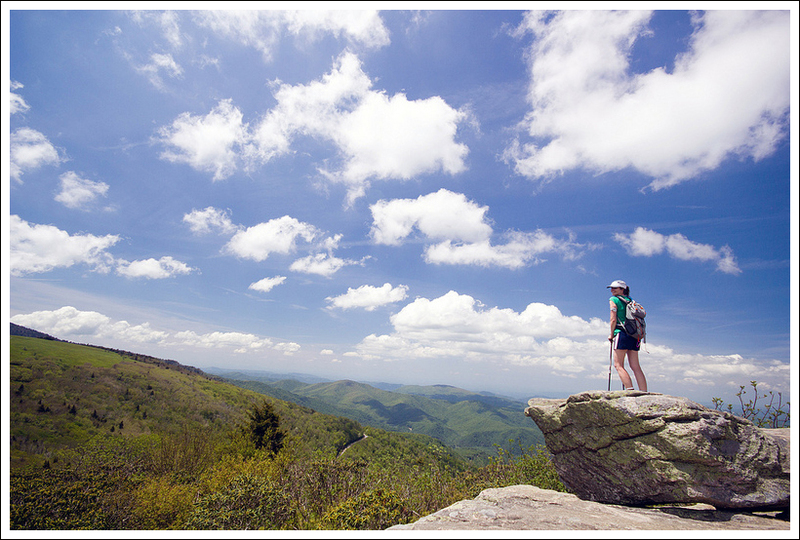 This might be one of the most beautiful view hikes we’ve done in the Appalachians! The moderate 5.1-mile climb along a smooth, easy trail takes you over three lofty balds that will make you feel on top of the world! The views on the Roan Mountain hike are amazing! There are open views of the mountains in every direction. Not many mountains in the area are as tall as Roan, so you’ll feel on top of the world this entire hike. If you look closely at this photo, you can see the Appalachian Trail meandering across ridgeline off in the distance. Below: Carvers Gap is on the Tennesse-North Carolina state line; Adam passes through one of the only tree-covered parts of the hike. After five exciting, action-packed days in the Smokies, it was time to move on to the third stop on our Southern Appalachians tour. We took our time leaving Gatlinburg. We bought more donuts from The Donut Friar (yay!) and did some laundry at the hotel (boo!). It’s no fun doing laundry on vacation – but five days of hiking creates quite a large heap of dirty clothes. After checking out, we meandered through Pigeon Forge. That town is loaded with crazy tourist attractions. I saw the Titanic, King Kong, an upside down building and even fed grapes and Milkbones to a trio of black bears (yes… it was safe and legal). [See a few amusing photos of Pigeon Forge] We even stopped at Wal-Mart to pick up extra memory cards for the camera. This turned out to be one of the wisest decisions on the trip – more about that later! By 11:00 we were cruising along, headed in the direction of Roan Mountain. I’d long heard tales about the mountain’s famous balds and stellar views, and was so excited to finally have a chance to see for myself. We finally got to Roan Mountain around 1:30 in the afternoon. Our hike started off at Carvers Gap, straddling the North Carolina/Tennessee line at 5,512 feet. Even from the parking lot, I could tell that this was going to be a special hike. First of all, we had amazing weather! Lower elevations were hot and sunny (mid-90’s back home in Virginia! 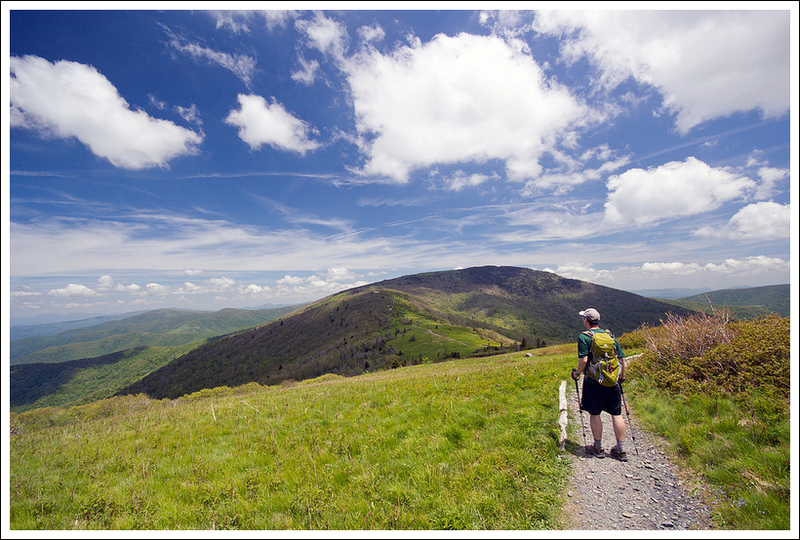 ), but Roan Mountain was sitting in the low 70’s with a pleasant breeze, brilliant blue skies, and puffy clouds. It was truly perfect hiking weather. Second of all, the view from Carvers Gap was lovely – hinting at the amazing vistas yet to come. I put on a hat and lots of sunscreen, packed snacks and filled my CamelBak. As it turns out, I missed a large spot on my shoulder with the sunscreen, and ended up with an incredibly stupid-looking sunburn for the remainder of the trip. Christine takes in spectacular mountain views. Below: A photo similar to this, but including colorful Catawba rhododendrons was recently featured in Backpacker Magazine; Funny portrayal of an AT Thru-Hiker on the sign. The hike climbs uphill from the parking lot, following the Appalachian Trail, before quickly entering a thick stand of evergreens. This small patch of forest is one of the only spots on the hike that does not have a 360 degree panoramic view. Once you clear these trees, the remainder of the hike is a spectacular, mile-high stroll along one of the most beautiful view trails I’ve ever seen. Photos don’t come close to capturing how breathtaking views are along this stretch of trail. If I’ve ever been any place that inspired me to have a Julie Andrew’s moment (you know… the opening scenes of the Sound of Music where she’s twirling around singing ‘The Hills are Alive’) – this was the place. Of course, I didn’t actually do that, because truth be told, I don’t like musicals. But, I kind of understand the urge to burst into song when I see someplace this beautiful! The first bald you come to is Round Bald at 5,826 feet. The views were wonderful, and I loved seeing the Appalachian Trail winding like a ribbon across the balds in the distance. From Round Bald, we descended into a small gap before climbing right back up to the summit of Jane Bald at 5,807 feet. On Jane Bald I recognized a spot that had recently been featured in a photograph in Backpacker magazine. I took my own, less exciting version of the shot. Why less exciting, you ask? Well, in addition to being famous for balds and view, Roan Mountain is also famous for its dramatic Catawba Rhododendron bloom. The mountain is home to the world’s largest natural rhododendron garden. 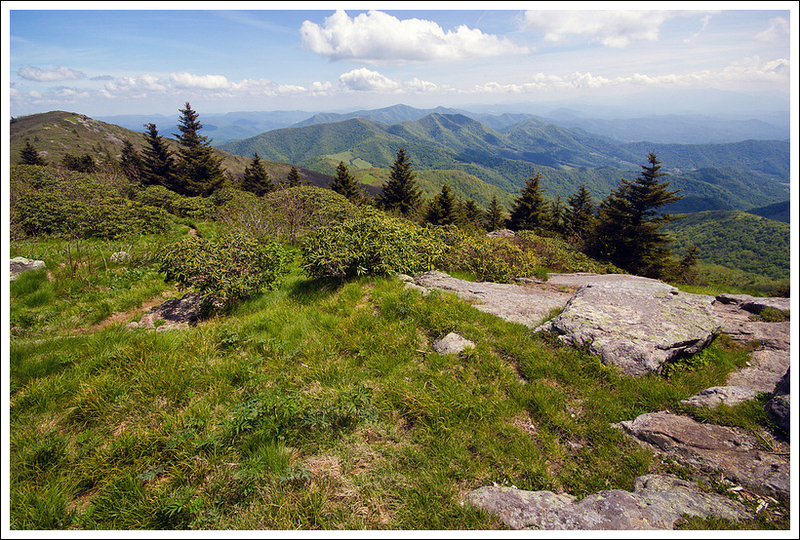 Roan Mountain State Park even holds a festival every June to celebrate the peak color. Many of the most memorable photos of Roan Mountain include the famous rhododendrons, including the one I had spotted in the magazine. Our hike took place a couple weeks before the bloom began, so while we missed the color, we benefited from lower traffic on the trail. I’ve heard Roan Mountain is crawling with crowds at bloom time! After enjoying the views from Jane Bald, we descended again to a split in the trail. 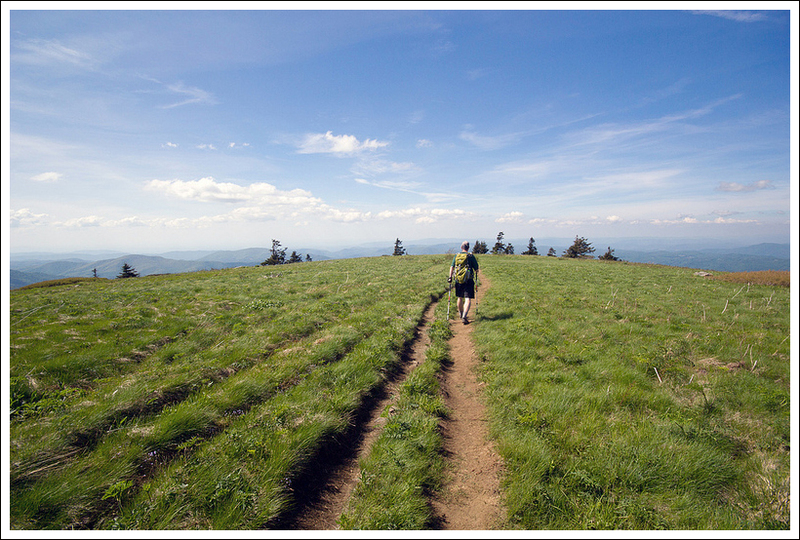 To the left, the Appalachian Trail continues, to the right a park trail continues to the third, and highest/largest of the three balds – Grassy Ridge Bald. There was a funny, hand-drawn illustration of a thru-hiker on the trail junction sign. I wonder if it was drawn by a thru-hiker or someone who was simply familiar with standard thru-hiker smells. 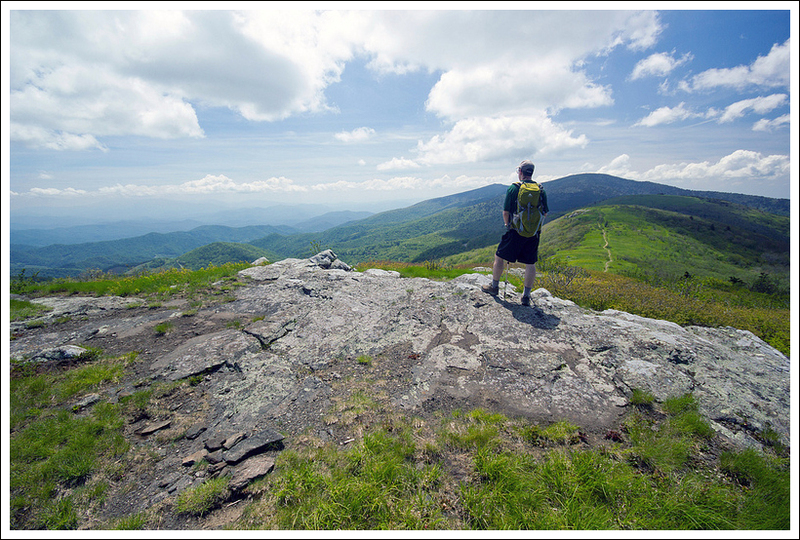 The climb to Grassy Ridge Bald (6,189 feet) is the only significant ascent on the hike. 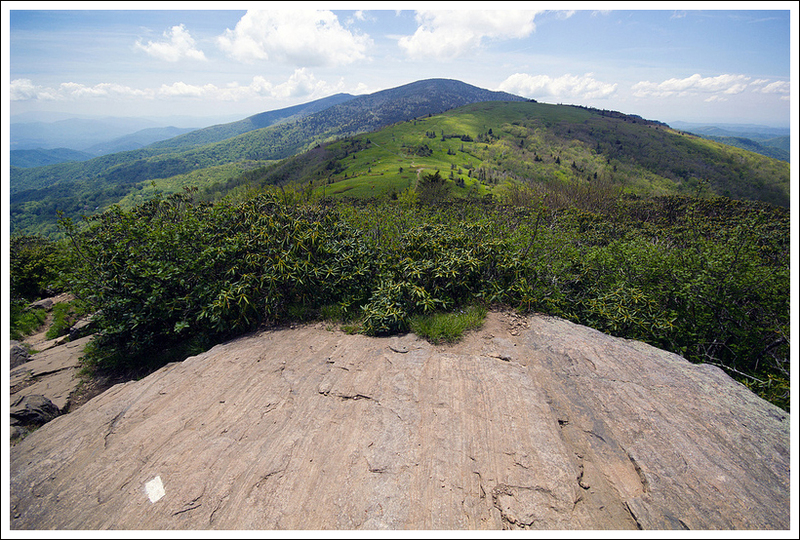 An elevation gain of about 500 feet leads you a large grassy bald dotted with rocks. Adam did some hunting for geocaches, while I found the perfect rock perch for eating cookies. I still had a pack of Oreos that had been part of my LeConte bagged lunch. They were a nice treat to enjoy in such a beautiful place! We spent a lot of time on Grassy Ridge enjoying the views and chatting with a local teacher we met at the summit. He shared tales of running whitewater in the Smokies and hiking Half Dome in Yosemite. He also told us a bit about how the balds are maintained. Apparently, Roan Mountain uses a combination of mower and goat grazing to keep the balds cleared. I was hoping we’d spot the goats, but we never did. As late afternoon approached, we slowly made our way back down the trail. The light was so beautiful on the mountains! I still can’t believe how many ridges and layers of mountains we could see from the trail. We recognized Mt. Mitchell by its height and Grandfather Mountain by its shape. The walk back to the car went by way too fast for my liking! As soon as we were back I told Adam, ‘I want to hike it again!’ And, I’m certain we will – Roan Mountain was far too perfect to visit just once. Grassy ridge offered plenty of rocks to sit on while enjoying the views. Below: Adam checks out the Peake Memorial; Walking along wide, open trail! After leaving Roan Mountain, we had a fairly short drive to our lodgings in Pineola, NC. We decided to stay in the same log cabin at the Pineola Inn that we rented when we visited the Linville area last fall. It’s such a nice, cozy place to stay in that area. We grabbed some dinner at Nick’s in Banner Elk and then settled in for the evening. Right after I downloaded my photos from the day, the screen of my laptop went black. As it turned out, the hard drive on my MacBook Pro chose the middle of vacation to call it quits. Thank goodness I had picked up that extra memory card before starting the Roan Mountain hike! If I hadn’t, I would have erased memory cards from earlier hikes and ended up losing files for good. I am so glad that didn’t happen! This has been one of my favorite hikes of recent memory. And that is saying a lot just coming from the Smokies. As I was waiting for Christine to get started, I was looking up the hillside and knew we were in for an amazing trip. We crossed the road and went through the fence opening to start our hike. 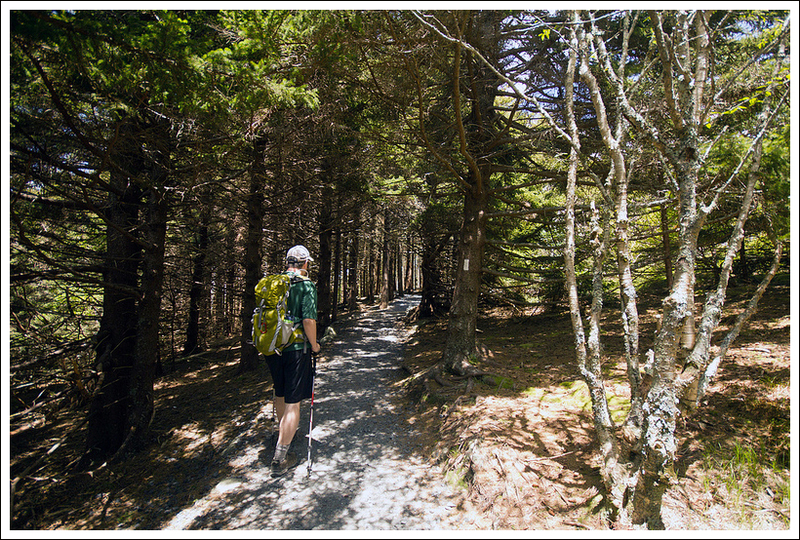 The hike climbs along the Appalachian Trail through an open area and then ducks quickly into a small grove of woods. Once you emerge out of the dense trees, the hiking is on open ground. It was just a few minutes along this trail that I proclaimed to Christine that this may be the best views I’ve ever had on a hike. It took her a little longer to admit the same thing, but soon she agreed. The views were all around us and in every direction you could see miles of layered mountain ridges. Since this hike straddles the border between North Carolina and Tennessee, I could see both states wanting to claim this hike for their own. About .5 miles along the hike, you arrive at the summit of the first bald, Round Bald. The views were great from here, but we knew we were just getting started. The hike back was so pretty… nothing like late afternoon light on mountains! Below: Taking in some final views; Dense rhododendron. We continued along the trail, which descended through a clear path and ascended again when we reached Jane Bald at 1.3 miles. The views continued to be amazing from near the summit of Jane Bald. The trail then continues to climb as you are making your way to Grassy Ridge. 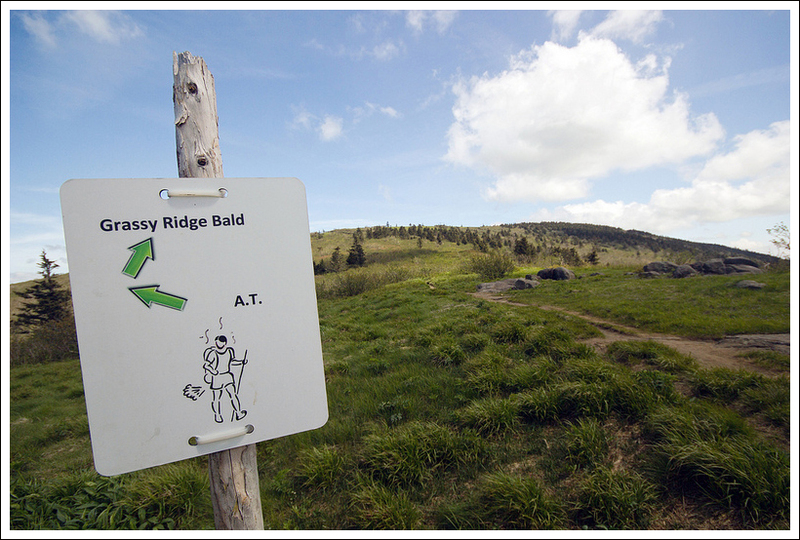 At 1.9 miles, you reach a junction – the left continues the Appalachian Trail, but take the right branch to reach the summit of the Grassy Ridge Bald. 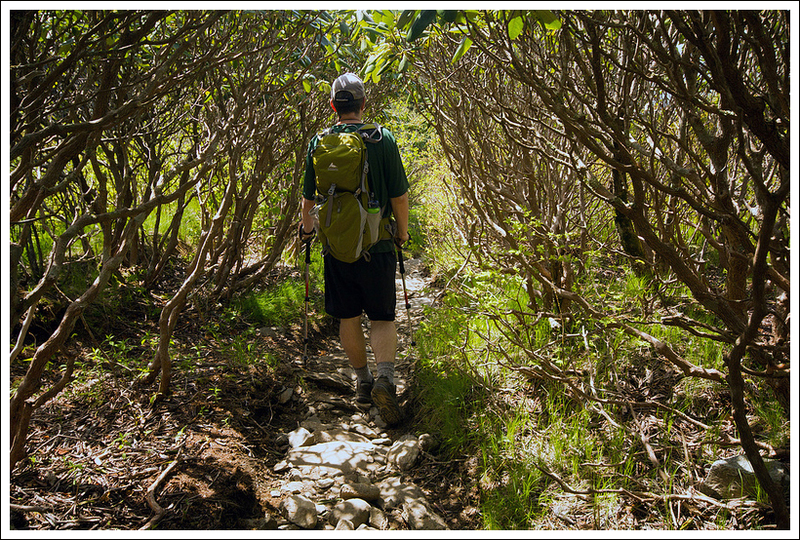 The trail cuts through a thick area of rhododendron before emerging to the larger bald area at 2.5 miles. 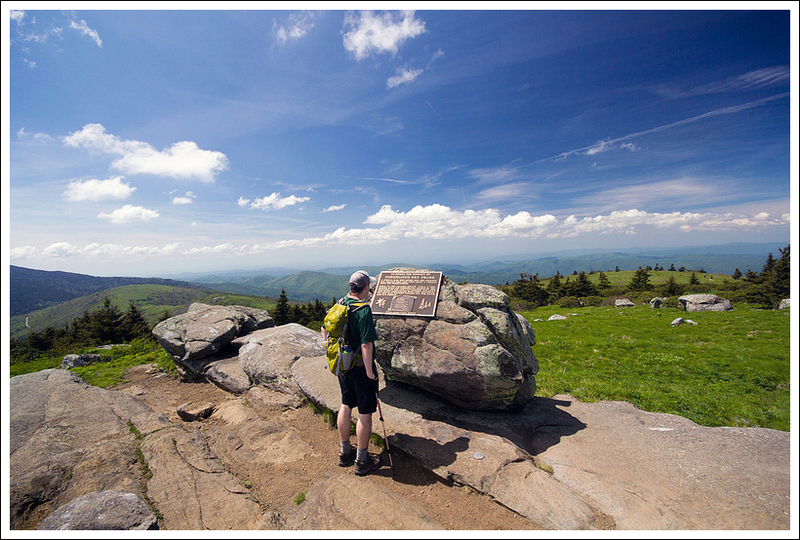 At the summit of this bald, you’ll see a large rock that has a bronze plaque dedicated to Cornelius Rex Peake, who was a high-country farmer of this area. What a nice tribute at such a scenic spot. This is a place that you will want to spend some time. The breathtaking views are in every direction and you will want to explore around the balds to take in views from a slightly different angle. Christine’s dad likes to sit and take in views for longer than we do. We know we would literally need to drag him away from here if he visited or he would stay up here for days. Head back the way that you came to reach your car in 5.1 miles. If you enjoy geocaching, there are two that you can find on the trail – Zelda’s Double Blaze Treasure and Roan’s Revenge. Unfortunately, I wasn’t able to claim either one after hunting a while, but hopefully they are being maintained. We headed back down because of the time of day and wanted to make it to check into the Pineola Inn. If you have a chance to visit this area, this is a great place to stay. I know we are already getting excited about the next time we will come back here. This is a place that you’ll want to visit more than once. Elevation Change – About 1150 ft. Difficulty – 2. The climbing on this hike was relatively gradual and gentle. Trail Conditions – 4. Very nice – well traveled and smooth. Wildlife – 1. We didn’t really see anything beyond birds. Ease to Navigate – 4. Good signage at the one trail junction. Each bald is marked. Solitude – 2. We saw a fair number of people, but I gather this was a lighter than usual crowd for Roan Mountain. 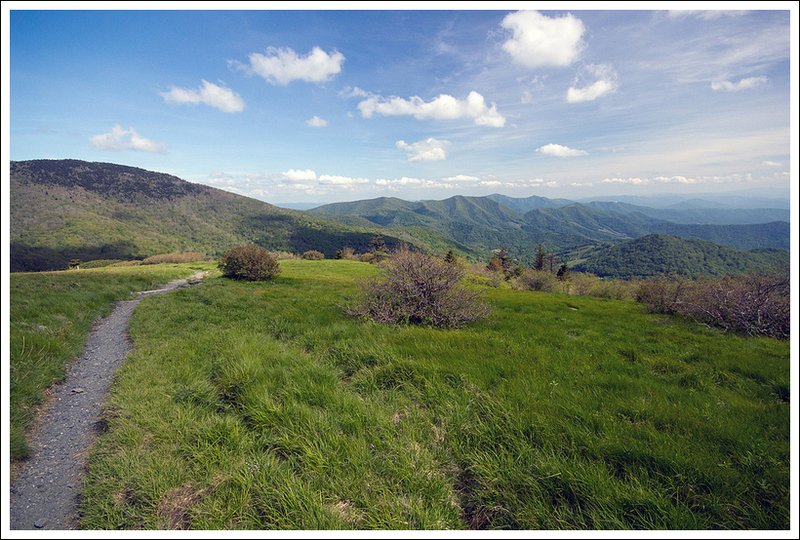 Directions to trailhead: From Roan Mountain, TN (located on US-19E), head south on TN-143. 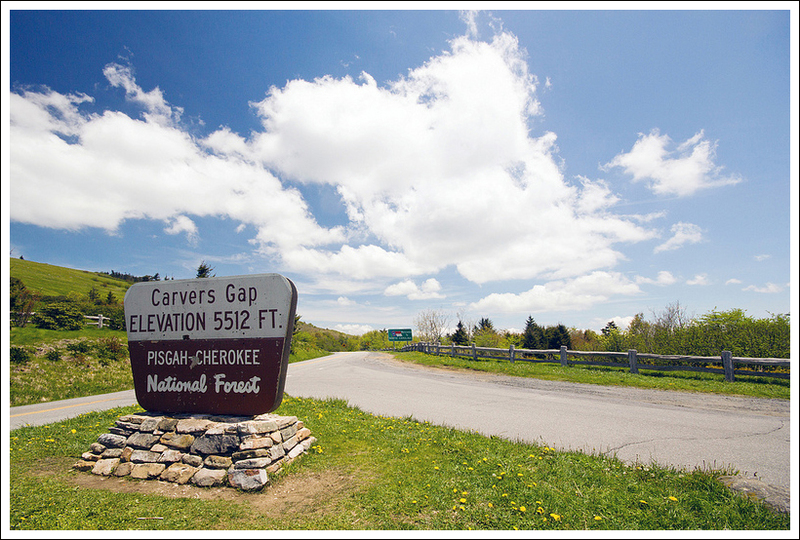 Go for 12.6 miles until you reach the top of the mountain and the parking lot for Carver’s Gap. You should see a “Welcome to North Carolina” sign nearby. Park in the lot on the right side of the road. Cross the road and go through the fence opening to start your hike heading north on the Appalachian Trail. It’s also very nice that this is just an hour away from me and I will be back with my girlfriend and our baby girl sometime soon-ish. Thanks for posting this hike and being as thorough as possible in your description. Several times I have used your descriptions alone to get all that I need to set out and have a pleasurable hike. Thanks! Thanks for the visit, Chad! You’re lucky to live so close to Roan!